The female lays one to three eggs per day in crevices or under objects. The female molts after laying a batch eggs and sheds her skin as many as 50 times after becoming an adult. The eggs hatch in about 43 days at 72-90 degrees F and at least 50-75% relative humidity. 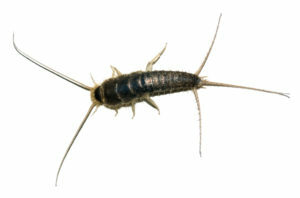 The young silverfish look exactly like the adults, except smaller, and feed on the same foods. Under ideal conditions, they molt every two to three weeks becoming adults in three to four months. However, under poor conditions, this might require two to three years. These insects are very long-lived, commonly living at least three years. The silverfish are unlike most other insects in that they continue to molt after they become adults. Silverfish are tropical insects that easily adapt to the structural environment. They live in warm (71-90 degrees F), moist locations in the structures; hide during the day; and rest in tight cracks and crevices. They roam great distances looking for food, but once a food source is located, they remain close until the supply is exhausted. They can be found throughout a structure from the basement to individual floors to attics to shingles on the roof. Outdoors, they can be found in mulch and under siding and roof shingles particularly cedar shakes. They readily feed on books, cloth, and sometimes dried meats or dead insects. They seem to be especially fond of the sizing on books and paper, and glues and pastes found on wallpaper, labels, and paper products. Adult centipedes are yellowish to dark brown, often with dark markings and 1/8-to 6-inches long. The body is flattened with 15 to 177 body segments, which typically have one pair of legs each. They have one pair of slender antennae. The house centipede is Grey-yellow with three stripes down the back and has very long legs bonded with white. The largest centipedes are found in the Southwest. Centipedes typically overwinter outdoors, and, in the summer, lay 35 eggs or more in or on the soil. Newly hatched centipedes have four pairs of legs; during subsequent molts, the centipede progressively increases the number of legs until becoming an adult. Adults of many species live a year and some as long as five to six years. Centipedes, including the house centipede, prefer to live in moist environments. The house centipede can live indoors in damp basements, moist closets, and bathrooms and outdoors under stones, decaying firewood, objects on the ground, piles of leaves, mulch, etc. Most centipedes are active at night. The first pair of legs on centipedes has poison glands, which are used to kill prey, such as insects or spiders. They obtain most of their water from their prey. 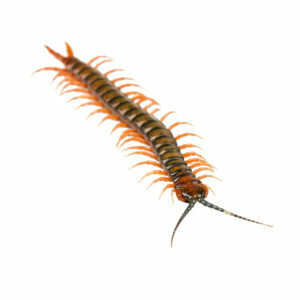 Centipedes can bite humans, but the bite is seldom worse than a bee sting. Adult earwigs are ¼-inch long, dark brown to black, with a red head and pale yellow-brown legs. The body is long and flattened. Earwigs usually have two pairs of wings, the hind wings being fully developed and folded beneath the short, leathery front wings. The thread-like antennae are half as long as the body. The most notable characteristic are pincer-like appendages at the end of the abdomen, the forceps. The female lays several batches of approximately 50 eggs in a nest-like shallow depression beneath a board or stone. Those laid in the winter hatch in about 72 days; those laid in the spring hatch in 20 days. The nymphs look much like the adults and molt four to five times before becoming adults, which takes about 56 days. Earwig females are interesting because they display a mothering instinct, protecting the nest and the nymphs until they have reached their second molt. Earwigs usually live outdoors and feed on plant material. They are very general feeders and seldom do a great deal of damage to any particular plant. They are active at night, hiding during the day under stones and other objects. 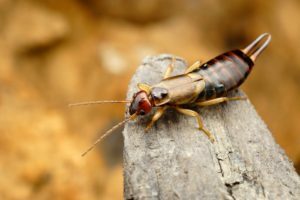 Earwigs are outdoor insects, which become household pests when they invade structures, usually in the fall or at night. Indoors, they are usually found in cracks and crevices and under furniture and carpeting. They are considered pests because of their presence and because they have a foul odor when crushed. Some species of earwigs are attracted to lights. 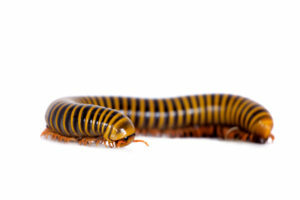 Most millipedes are brown or black, but some species are orange or red. They range in size from 5/8-inch to 4-inches in length. There are many species of millipedes, most of which are long, cylindrical, many-segmented, worm-like creatures. However, a few millipedes appear to be flattened. Every millipede has two pairs of legs attached to each apparent body segment. Females lay 20-300 eggs in nests in the soil. The eggs hatch after several weeks. The young initially have only three pairs of legs and seven segments. They undergo a series of seven to ten molts during which the number of legs and segments increase. Many species reach sexual maturity in two years, but some require four to five years to complete development. Adults can live several years. Most species overwinter as adults or young. Millipedes are found outdoors in situations where there is moisture and decaying organic matter, such as under trash, grass clippings, mulch, rotting firewood, leaf litter, etc. They can build up tremendous populations in forest litter and compost heaps. Millipedes become structural pests when they invade homes and other structures, sometimes in staggering numbers. This occurs when standing water in their natural habitat forces them out. Drought and their natural migratory and mating instincts also cause indoor movement in the fall. Millipedes usually did within a few days of entering a structure unless there is a source of high moisture and a food supply. Millipedes are active at night. They scavenge feeding on decaying organic matter. Most species produce a foul smelling fluid that comes out the sides of their bodies and is toxic to some insects and small animals. This substance can cause blisters on human skin.